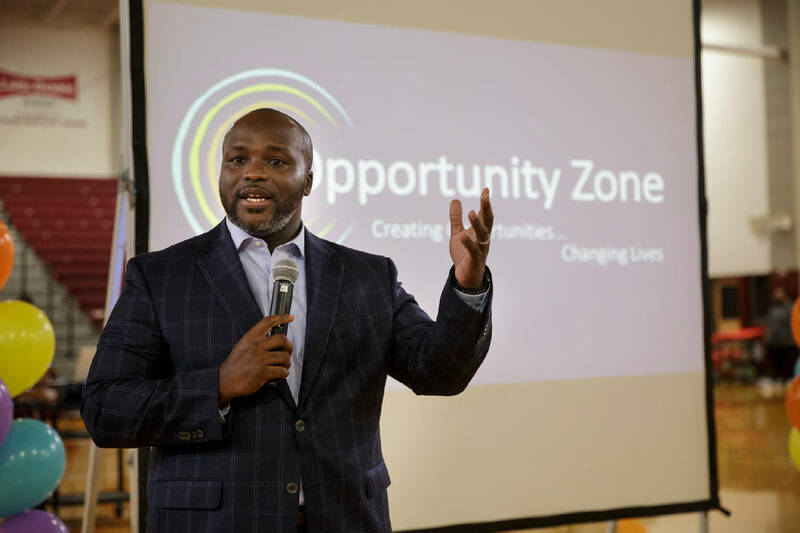 Schools Superintendent Bryan Johnson speaks during the Opportunity Zone Community Celebration Phase II at Howard School on Tuesday, Sept. 25, 2018, in Chattanooga, Tenn. Parents, school faculty and community members gathered to note the accomplishments of the Opportunity Zone schools. Following a lively discussion Tuesday night, the Hamilton County Board of Education is set to vote at its next meeting on how the school system's superintendent is to be evaluated. The board, which released preliminary evaluations of Superintendent Bryan Johnson in June, has been toiling over the specifics included in the performance evaluation. The current draft, which was discussed at Tuesday's policy committee meeting, consists of multiple measures — 70 percent of the evaluation is based on rating from 1 to 5 that the superintendent receives on strategic planning, student achievement, staff and personal relationships, school leadership, post-secondary opportunities, business and finance and his relationship with the board. Hamilton County Schools Superintendent Bryan Johnson speaks about his Future Ready 2023 plan during a Hamilton County School Board meeting Thursday, September 20, 2018 at the Hamilton County Department of Education in Chattanooga, Tennessee. Future Ready 2023 was one of the items scheduled to be adopted or rejected during Thursday night's meeting. The other 30 percent of Johnson's draft evaluation is focused on five goals for student achievement in 2019. The measures, which are only scored as a pass or fail, include 38 percent of third-graders being on track in reading, 24 percent pass rate for Algebra I students, 47 percent of students completing one or more post-secondary opportunities (such as AP courses or earning a credential), an average ACT composite score of 20.2 and an 86 percent graduation rate for the district. 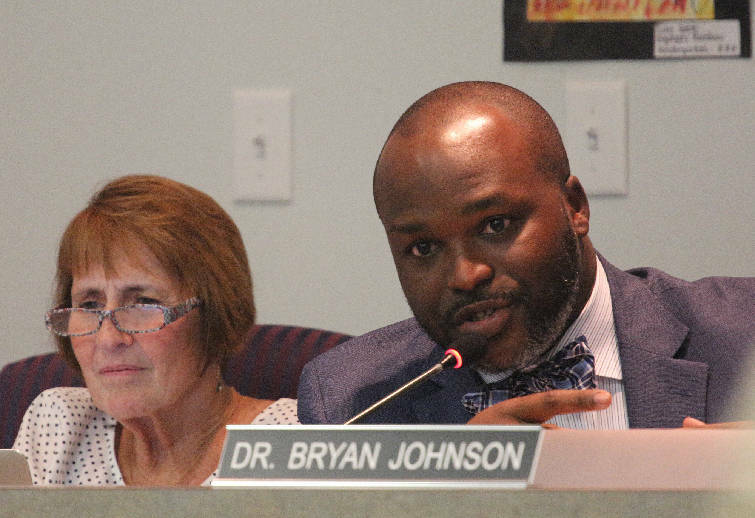 "This document that's before you is more rigorous an evaluation document than any superintendent evaluation this district has seen," Johnson told board members. "There are targets that I've included in here that very few superintendents would put themselves in that position to be evaluated on." Board member Joe Smith, of District 3, said he thought the measures were "reasonable, attainable and challenging." "My goodness, what more could we ask for?" Smith said. Board members did debate other components of Johnson's contract, including incentives, as measures within his evaluation. District 9 board member Steve Highlander said he'd like to see Johnson evaluated on the same things for which he would be eligible to receive incentives. In his contract, approved by the board in July 2017, Johnson can receive $7,500 to $15,000 if the district receives a Tennessee Value-Added Assessment (TVAAS) score of a Level 4 or higher and $7,500 if the third-grade TNReady success rate increases 10 or more percentage points. According to the contract, Johnson is eligible to receive these raises each year after the 2017-18 school year. But Johnson disagreed with Highlander. "I think to bring a contractual component into an evaluation document, that's not something we would do to principals or teachers," Johnson said. "I think there is a real fine line there connecting the spirit of the incentive to the evaluation." Board member Kathy Lennon, of District 2, said she did not think it was fair to evaluate Johnson based on student performance. District 8 board member Tucker McClendon echoed Lennon's thoughts. "He's evaluated on what he did, not what he didn't do," he said. Some board members weren't sure they could include incentive measures into Johnson's evaluation. Board member Karitsa Mosley Jones, of District 5, asked what the board would do if Johnson achieved those goals. "What will we do to evaluate [him] next year?" she said. Mosley Jones also noted that the achievements eligible for performance raises were lofty goals. "He isn't a magician, he didn't come in here like David Copperfield. He inherited a mess," she said. "It's aggressive, and clearly he's been aggressive in his work." New board member Jenny Hill, of District 6, suggested the superintendent evaluation should be strongly aligned with the three-year strategic plan, Future Ready 2023, which the district adopted last month. She suggested adding components such as the achievement of minority subgroups that are tracked under the federal education law, the Every Student Succeeds Act. As far as the five target measures already included in the evaluation, Hill said she approved of them. "I feel like these are really aggressive and really appropriate," Hill said. "I'm quite comfortable with the focus five where they are, and if Dr. Johnson is hitting these numbers, that's right where we need to be." New board chairman Joe Wingate, of District 7, said the draft evaluation was the result of a lot of his work with Johnson, noting that the board was behind on evaluating the superintendent — the contract notes that "no later than the 30th day of June each calendar year the Board shall evaluate the director's performance." Wingate said he hoped to vote on the evaluation at Thursday's regular monthly school board meeting.